There are Rites of Passage in every walk of life, and we celebrated one last year when we took the first male that we bred out to win 7 championships. We decided to send PLA Bailey to Sirius Black in 2005. Bailey, herself a champion, produces crias with outstanding conformation and high luster, and we wanted one in black. She and Sirius Black came through for us with the most amazing-looking cria we had ever seen. We were ecstatic that it was a male! Runaround Sue is one of our jet black foundation females. 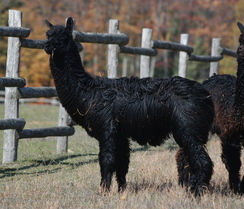 A Boreas daughter, Sue has given us jet black in both of her first two cria with beautiful fiber and excellent luster and conformation. We are pretty pumped about both of these offspring. 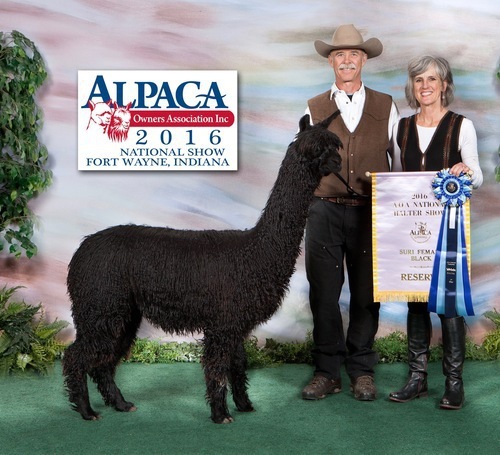 GLR Sly, is a working herd sire and his sister GLR Sunita was purchased by Ray and Candy McMahan of Raynay Alpacas at the completion of her show career in 2016. With purchase, Sue can be bred to anyone of our award winning herdsires, including Cinders!